Open Shutters also calls to mind the lens of a camera—in the villanelle “School Pictures” or in the stirring sequence “In the Guesthouse,” which, inspired by photographs of a family across three generations, offers at once a social history of America and a love story. Darkness and light interact throughout the book—in poems about September 11; about a dog named Shadow; about a blind centenarian who still pretends to read the paper; about a woman shaken by the death of her therapist. A section of light verse highlights the wit and grace that have long distinguished Salter’s most serious work. Fittingly, the volume fools the eye once more by closing with “An Open Book,” in which a Muslim family praying at a funeral seek consolation in the pages formed by their upturned palms. 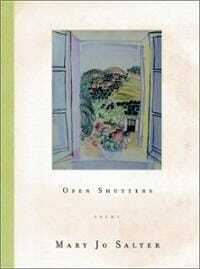 Open Shutters is the achievement of a remarkable poet, whose concerns and stylistic range continue to grow, encompassing ever larger themes, becoming ever more open.